Here’s what’s up in the world of TV for Wednesday, November 2. All times are Eastern. MLB: World Series Game #7 (Fox, 7:30 p.m.): Honestly, assuming this is happening, you’re probably going to be watching this. The Cubs and the Indians face off one last time to decide once and for all who’s the most dominant baseball team. Actually, is “dominant” really the word in baseball? Who’s the craftiest baseball team? The most svelte baseball team? We’ll figure this out and get back to you. Stan Against Evil (IFC, 10/10:30 p.m.): Ah, Stan. Long time no see. And now we see you’re here for your official debut—how exciting. The rest of you have already read Dennis Perkins’ review of the premiere episode, “Dig Me Up, Dig Me Down,” so now you can rewatch the episode, knowing everything Dennis thought about it. The real question is how he will feel about the second episode, “Know, Know, Know Your Goat.” First of all, great title. Second of all: “Stan’s daughter brings home a goat that is really an ancient hircine demon.” It may only be the second episode, but classic Stan’s daughter, right? Triumph’s Election Watch 2016 (Hulu, midnight): It’s “The Home Stretch,” and in order to fully, truly grasp that, sometimes you just need a dog puppet to tell you all about it. The 50th Annual CMA Awards (ABC, 8 p.m.): Someone asked the question, “What’s more American than baseball?” ABC apparently said, “Country music, y’all.” So that’s why the World Series is (presumably) on and ABC’s attempting to fight that with the 50th Annual CMA Awards. All we know is that Rayna James probably won’t win every award again this year. Probably. Unusually Thicke (Pop TV, 8/8:30p.m. ): There have been two seasons of this—a show titled Unusually Thicke—and this is the end of said second season. First up is “Growing Strains,” because, you know. Alan Thicke was the dad on Growing Pains. And we’re also assuming he’s a big fan of The Strain? Then, the season ends with “The Bucket List,” in which “Alan pushes his luck when he creates a ‘bucket list’ of things he thinks Tanya wants to do most for her 40th birthday.” Well that sounds like the type of wacky scenario that would happen on Growing Pains, but we can’t see Dr. Jason Seaver doing such a thing. Mike would though. 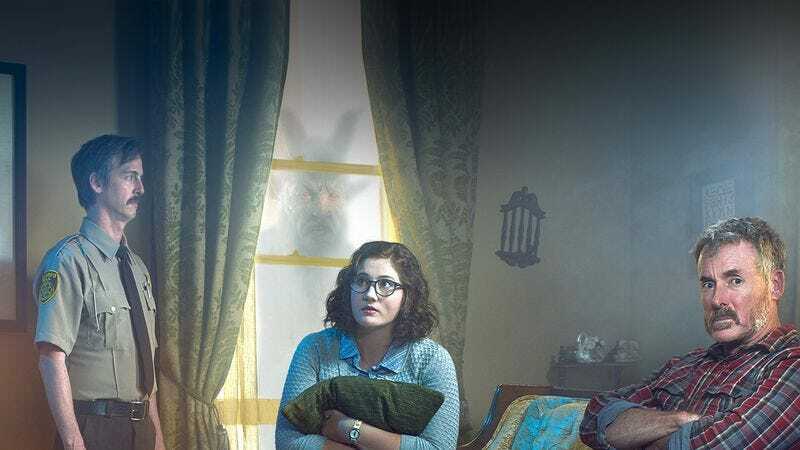 Grave Secrets (Investigation Discovery, 9 p.m.): There’s a new Investigation Discovery series, which means a new way to be reminded that you can never trust another living soul. In the series premiere of Grave Secrets, “the police suspect a Las Vegas man of murdering his wife, but he has an airtight alibi; and, as the case grows cold, an unexpected tip turns up the heat on the investigation.” Let us guess: The man killed his wife? We’ll just have to wait and see. We’re sure Investigation Discovery will surprise us with this show. Little Women: L.A. (Lifetime, 9 p.m.): This is the first of two Little Women franchise shows on tonight, with the season finale of Little Women: L.A. “The ladies find themselves at an emotional impasse following Tonya’s survivalist retreat.” Well that’s understandable, because there’s nothing relaxing about a “survivalist retreat.” Hopefully the reunion is only about that emotionally taxing choice of a season-finale trip. Years Of Living Dangerously (NatGeo, 10 p.m.): NatGeo’s Emmy award-winning documentary series makes its time-slot premiere tonight with the second episode of its second season, “Gathering Storm.” In the episode, “the outcome of the rising seas is discussed,” with Jack Black and Ian Somerhalder as the celebrity guests. Rachel Dratch’s Late Night Snack (truTV, 10:30 p.m.): Rachel Dratch’s weekly comedy showcase/TruTV series continues its first season with “Tonight’s Specials.” What can you expect? Well, we can tell you not to expect any snacks coming out of your TV. That’s not what this is, so stop trying. Tucker & Dale Vs. Evil (Hulu/Google Play/iTunes/Netflix/vudu/YouTube): You’re not the only one who can take on evil, Stan!